Superman is in Des Moines, Iowa doing super deeds as much as he can, but despite that he doubts himself and the good he does. Lois is getting more and more antsy with Clark's behavior. For example instead of using his encrypted JLA communicator to call Lois or even using his Super hearing and voice projection he is using a basic, easily trackable and monitored cellphone! Clark points out he's trying to reconnect with the average man. Lois can't understand why, if he wants to reconnect with people, he won't just do the logical thing and go back to his hometown to be with his family. Clark can't answer, almost like he's been written into a dead end, but an explosion on Lois' side calls for action, immediate action. A power plant nearby is on fire and Superman arrives to evacuate all the workers. Some quick thinking and Superman uses his speed to create a vortex from a nearby lake to wash out the fire. Then stealing some iron poles from a passing truck he repairs the structural damage of the factory. The commotion over, Superman confronts the workers, reporter Lois Lane and a disgruntled ex-worker Manuel. It turns out Lois is no longer following Superman's soul search across the united states, instead leaving it to Clark. Manuel instead had approached her with an expose that is strangely in keeping with Superman's original mission - truth and justice. Manuel had discovered that his former employees were avoiding closure by the EPA by bribing local officials and using substandard equipment that had leaked chemicals into the local water and food supplies. Superman inspects the local grounds and does discover chloride has indeed leaked into the ground. Before Superman steps in, the locals beg him not to aid the shutdown of the factory. It's the lifeblood of the town, the sole employer of the local communities and almost a legacy of employment. Superman is firmly on the fence, chloride is bad for the environment but it isn't poisonous. So he takes the workers at their word that they'll clean up and sort out the factory's failings. Watching from a distance the krypto-freak school teacher watches and smiles, but Lois on the other hand is far from happy. At least she was tolerating it until Clark orders Lois not to print her expose. Lois is not one to be ordered by any man and dismisses him. Clark physically clamps his hand around Lois' arm and threatens her that not only will he tell her she can't run the story but he won't allow her to run it. Lois is visibly shocked, Clark has never threatened her, nor manhandled her but dismisses it as crazy talk. Once alone Clark tries repeatedly to call Lois. Unsurprisingly, his wife, isn't answering. 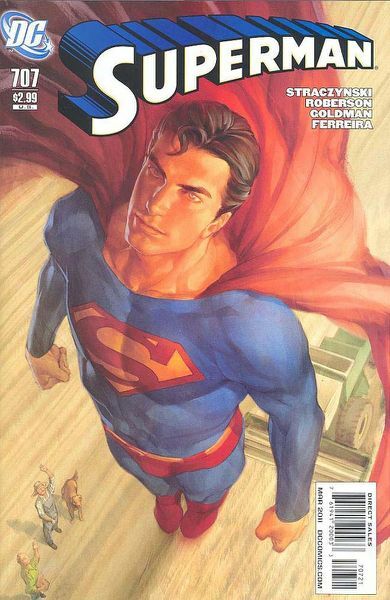 Superman continues his walk but he's abruptly stopped by observers that empathize with his loss of personal confidence. They are the Superman Squad and they have the answers to Superman's quest. Story - 1: The dilemma of the factory polluting and the possible shut down effect is interesting, but after the 'rinse and repeat' formula of similar dilemmas over the past six months it's getting tiresome. The saving grace could have been Lois & Clark but, well, maybe we could have done without it. A few months ago when Lois and Clark slept together in a motel, Lois made a flippant remark about their marriage being on shaky ground, this issue went all out and I felt truly sad. Lois, who has been pretty much husbandless for the past two years has been so understanding (like the fans) as the writers story-lined some of the worst arcs Superman has ever been a part of (or not even been present in, as the case may be). Superman did two things this issue I've never seen him do and am pretty disgusted that not one but TWO so called Superman fans could write it. Clark threatened his wife - not just verbally, but physically too. If Lois prints the story, he's prepared to do more than clamp her arm. The 'I'm sorry, I don't know what I'm doing anymore' phone call afterwards reinforced the horrible direction further. Is it the magical influence of the school teacher? The loss of his people and remaining family? The loss of people's adoration? Not sure any are an excuse for what happened here. Ever. I read and reread the scene in case I was overreacting. I even went back and read the motel scene that foreshadowed it. So where I might have been dismissive of a marriage in trouble, might have brushed it off as an overreaction or over analysis; all I had to do was look at Clark's grinding teeth, furrowed brow and squinting eyes to remind me that his threat wasn't without meaning. And as an aside, the explanation for Clark using an open cellphone rather than methods that can't be tracked or monitored and then brushing off of the ramifications was just dumbfounding especially since Project 7734 had been doing just that for the past two years. Art - 4: Despite Lois having Power Girl inspired cleavage (a pro or con, depending on your stance), the art was very pleasing to the eye, detailed and showed locales in an innovative way that didn't seem shoehorned in despite the fact they obviously were. The action was equally balanced with the human drama and genuinely depicted the best part of the book. Cover Art - 2: What could have been an iconic depiction just looks odd. Superman's head in relation to his body is ridiculously out of balance. You could argue perspective but then Superman wouldn't have thunder thighs would he? Then there is the shield, I prefer a larger shield but this one goes from collar bone to belly button. The cape looks nice though. 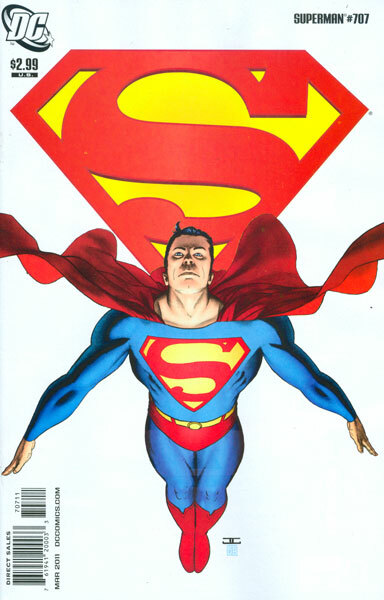 Cover Art (Alternate Cover) - 5: This is a Superman cover. It just takes your breath away. Jo Chen has painted a fantastic image of the Man of Steel, and after reading the interior it's the best medicine to forget the story.